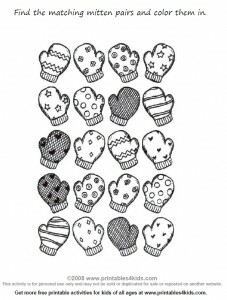 Can you find each matching mitten pair? Color the matching pair and then practice your cutting skills. Cut each mitten out and play the matching game again. Perfect for preschoolers, kindergarten fun and other early learners! Click on the image above to view and print the Mitten Math worksheet full size or download printable Mitten Match preschool worksheet as a PDF file.